Joy Angela Anderson aka Alegria de la Luz is from the Los Angeles Eastside. Influenced by Chicana/o culture, she explores cultural and contemporary arts with questions about inclusivity, identity, oppression, and non-Western notions of healing. 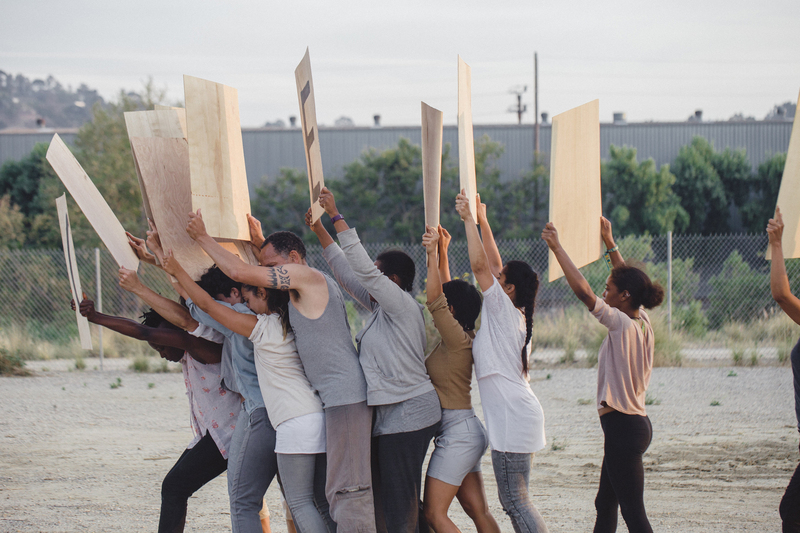 Prior to her formal education at UCLA and the Roski School of Fine Arts, Anderson collaborated with radical youth collectives as an organizer, curator performer, facilitator, and teacher. She has worked as a museum educator at the California African American Museum, Hammer Museum, MOCA LA, and the Craft and Folk Art Museum. Charmaine Bee is a graduate of California Institute of the Arts (MFA.) She is an interdisciplinary visual artist. Through photography, installation, sound and textile she explores the impact of historically charged materials on the body. She has also studied herbalism with Karen Rose. She resides in Brooklyn and Los Angeles. Heyward Bracey – a butoh influenced dancer/movement artist – has worked and performed with a number of experimental dance collectives including Corpus Delicti, Body Weather Laboratory, Los Angeles Movement Arts and most recently WXPT – The School for the Movement of the Technicolor People. He has collaborated with master butoh artist Katsura Kan in Los Angeles, New York and at the Seattle International Dance Festival. His recent solo “Stealing Skin 6” was presented at the Bare Bones Butoh Showcase in San Francisco, Pieter Performance Space in Los Angeles and Central Cultural Los Talleres in Mexico City. Heyward’s interest in the body as a social/political/spiritual process has led to recent collaborations with Emily Mast in “The Least Important Things,” presented at the Los Angeles County Museum of Art and “The Cage is a Stage,” presented at University of Toronto Mississauga, the Harbourfront Centre Theater – Toronto, and the REDCAT – Los Angeles. Rebecca Bruno (b. 1985) lives and works in Los Angeles. She received a BA in Dance from the University of California San Diego in 2008 and conservatory training at The Jerusalem Academy of Music and Dance 2005-2006. In 2013 Bruno founded homeLA, a performance project dedicated to dance process in private space. One-person exhibitions of her work have been presented at Honor Fraser Gallery, Los Angeles, CA (2016); Norton Simon Museum, Los Angeles, CA (2016), the Annenberg Community Beach House, Los Angeles, CA (2015); and PAM Residencies, Los Angeles, CA (2014). Her work has been included in festivals and exhibitions at The Neutra Studios and Residence (The VDL House), Los Angeles, CA (2017); Human Resources, Los Angeles, CA (2017); Hammer Museum, Los Angeles, CA (2016), Los Angeles, CA; REDCAT Theater, Los Angeles, CA (2016 and 2014); Pitzer College Kallick Gallery, Claremont, CA (2016); Velaslavasay Panorama, Los Angeles, CA (2016); Live Arts Los Angeles, CA (2015); Elephant Gallery, Los Angeles, CA (2015); FahrenheitFLAX, Los Angeles, CA (2014); Machine Projects, Los Angeles, CA (2014); Eden’s Expressway through Movement Research, New York, NY (2014); Pieter PASD, Los Angeles, CA (2012); Space4Art, San Diego, CA (2011); University Art Gallery, San Diego, CA (2011); Potiker Theatre, San Diego, CA (2009); Sushi, San Diego, CA (2008); Calit2, San Diego, CA (2007); and The LAB, Jerusalem, Israel (2006). Bruno is a recipient of the WORD Grant, Los Angeles (2016); CHIME (Choreographers in Mentorship Exchange) in Southern California Grant (2015); Annenberg Community Beach House Choreographer in Residence Grant (2015); Prix Marcel Duchamp, associate choreographer for Julien Prévieux (2014); Kendall Laurel Liu Dance Award, San Diego, CA (2008); and Stewart Prize in Choreography, San Diego, CA (2005). Bruno has collaborated on the works of many artists including Flora Wiegmann, taisha paggett and WXPT, Pablo Bronstein, Julien Prévieux, Yael Davids, Yolande Snaith, Monica Bill Barnes, Allyson Green, and Jean Isaacs. Alfonso Cervera is a recent graduate from the University of California, Riverside where he received his MFA in Experimental Choreography. Cervera has received awards such as the Lambda Award, Dean’s Distinguished Fellowship Award, the MFA Fellowship Award, Dance Magazine award for best choreography in a collaborative work with Irvin Gonzalez, Hyoin Jun, and Maggie Sniffen. Cervera’s interest and research as a choreographer draw from his experiences as a folklórico dancer and the entanglement that it has made in his practice of contemporary movement. Cervera has had various opportunities to showcase collaborative and independent work at Field Studies in New York; La Peña n Berkeley; BRAVA Ballet Arts in Riverside; Lux Boreal’s 4 x 4 in Tijuana, Mexico; The Bootleg Theater; REDCAT Center for Contemporary Arts; Brockus Project Studio; Festival; homeLA; and Pieter Performance Space. Cervera is in current collaboration with his collective Primera Generacion Dance Collective, WHAT Dance Theatre, WXPT, and with Hyoin Jun. Erin Christovale is the Assistant Curator at the Hammer Museum in Los Angeles. She is also the curator of Black Radical Imagination with Amir George, which has screened both nationally and internationally in spaces such as MoMA PS1, MOCA Los Angeles, and the Museo Taller José Clemente Orozco. Exhibitions include a/wake in the water: Meditations on Disaster (2014) at the Museum of Contemporary African Diasporan Arts, Memoirs of A Watermelon Woman (2016) and A Subtle Likeness (2016) at the ONE National Gay and Lesbian Archives, and S/Election: Democracy, Citizenship, Freedom (2016) at the Los Angeles Municipal Art Gallery and baby boy (2017) at Transmission Glasgow. She recently organized the 28th anniversary of ALTERNATE ENDINGS, RADICAL BEGINNINGS with Vivian Crockett as part of Visual AIDS’ project, A Day With(Out) Art and is currently organizing Made in L.A. 2018 with Anne Ellegood at the Hammer Museum. Loren Fenton is a Los Angeles-based performer who participates in the creation of contemporary theater, film, dance, and visual art. She enjoys making work that pushes the boundaries of form and illuminates untold stories / unseen lives. Recent work: Endless Love/Reusable Parts (art – Hammer Museum); A Beautiful Game (dance); Immaculate Heart (film); and Maria Kizito (theater). Upcoming projects: The Price of Salt (theater). Loren received her B.A. from Harvard University, and her M.F.A. in Acting from CalArts. She is a member of SAG-AFTRA. Maria Garcia Maea is an LA-based performer, sound artist & object maker. She has performed in works by Rafa Esparza, Julie Tolentino, Ron Athey, taisha paggett and curator Lucky Dragons. As a performer Maria uses movement, objects, sound and ritual magic to create energetic containers to fill and empty. Performance acts as a visual representation of her concentrated efforts at self-realization and unity. Environments are created in her performances as space to navigate double consciousness– vulnerably existing in the unknown and empowered in deep ancestral knowing. As a first generation artist of mixed-identity she uses her practice to display how the layers of her upbringing and culture live within her work. This practice is an attempt to fuse disparate parts of personal identity to create more honest spaces for work and self to live in. Through this work she intends to open possibilities and exchange experience. Meena Murugesan is a choreographer, performer, video artist, and arts educator. Meena creates experimental non-linear narratives with moving images at the intersection of live performance, video art, and activism. Meena’s movement practice is deeply rooted in bharata natyam, improvisation, somatic bodywork, and house dance. Meena designs multiple channel video installations for live performance and is currently collaborating with choreographers Marjani Forte-Saunders, Sita Frederick, d. Sabela grimes, and others. Meena is a member of Post Natyam Collective, taisha paggett’s WXPT, and also choreographs solo dances (karuppu, weusedtoseethis, split/focus, etc.). As an arts educator with over fifteen years of experience, Meena facilitates ethical filmmaking and movement processes with racialized youth, and criminalized communities as collaborative acts that hope to break down stereotypes, stigma, and systems of oppression. Sebastian Peters-Lazaro is an interdisciplinary performance artist from Northern California. In 2008 he co-founded Four Larks in Melbourne, Australia, focusing on site responsive, immersive performance with a strong movement identity. Sebastian currently acts as Choreographer, Designer, and Production Manager. Orpheus, developed at the Getty Villa, marked his return to Los Angeles. In 2015 The Temptation of St Antony garnered Ovation and Stage Raw award nominations for Sebastian in design, direction, and choreography and was restaged in 2016. Sebastian is also a founding member of Schema 47, an experimental research studio that brings together artists, designers, and research scientists from JPL and Caltech in an anit disciplinary model of investigation, aiming to strengthen and expand the notion of collaboration between art and science. Sebastian has lead workshops as an artist in residence at Cal State Northridge, Melbourne University, and Lemoyne College. Kristianne Salcines: Dancer. Maker. Collaborator. Facilitator. Salcines is a queer Filipina born and raised in the Philippines. She explores her cultural heritage and gender representation in her choreographic work. To integrate her culture and non-western ideologies in her artistic work, she incorporates the epistemologies of Filipino Martial Arts and other Southeast Asian movement practices such as Qigong and Taiji in her movement practices. Her physical practice includes, but not limited to, Contact Improvisation, Martial Arts, Improvisation, Authentic Movement, and Contemporary Dance. Currently, her research focuses on queer identifying people of color and their ways of developing survival strategies to cope in our current sociopolitical realities. She examines how can these strategies be translated into a personal physical practice, which she then will use as a catalyst to a creative healing process. She is interested in reimagining the process of making-dances, how can the process be serving the dancers as they continue to have agency on the trajectory of the work? .Turay is a Black, Queer, gender-non-conforming performance artist and social justice advocate. Dance has nourished Ture’s wellness since childhood. Hence, their decision to lean into the deep learning gained through regular participation in transformative dance with WXPT. Transformative Healing Justice circles have both oriented and affirmed the healing presence of dance in Ture’s life. They center dance as a means of intentional and radical self-care. Jas Michelle is a queer, gender-non-binary grower, community organizer and Creative of African descent. Jas is inspired by the self-determinant and resilient powers of storytelling through dance|movement and the stewardship of mama Earth. Dance|Movement has always been a powerful expression of freedom for them. What grounds them in their path is their commitment to the resiliency of their communities and the nourishment of our agency and adaptability. Jas joined the inaugural group of WXPT in 2014. Devika Wickremesinghe is a dance and performance artist originally from Staten Island, New York. In NYC she performed with K.J. Holmes, Vanessa Justice, Buck Wanner, ana Isabel keilson, and Mariangela Lopez’ ACCIDENTAL MOVEMENT. Since her arrival in Los Angeles she is a recent member of Alexx Shilling’s MODERN DANCERS OF AMERICA and has had the pleasure of performing in the work of Laurel Jenkins Tentindo and Sarah Leddy. She was most recently part of Maria Hassabi’s PLASTIC at the Hammer Museum. Alongside collaborator Samantha Allen, Devika makes short film and live dances as part of the Institut IDGAF. Devika was trained at the Kane School for Core Integration in NYC and continues to teach Pilates on the west coast. She is way up, she feels blessed. Suné Woods is an artist living in Los Angeles. Her work takes the form of video installations, photographs, and collage. Woods practice examines absences and vulnerabilities within cultural and social histories. She also uses microsomal sites such as family to understand larger sociological phenomenon, imperialist mechanisms, & formations of knowledge. She is interested in how language is emoted, guarded, and translated through the absence/presence of a physical body. Woods has served as Visiting Faculty in the CalArts Photography & Media Program, Vermont College of Fine Arts Visual Art Program, and has mentored fellows and organized lectures with at land’s edge, a platform for visual research and catalyst for decolonial thought and action in Los Angeles.